This semester I have been afforded the opportunity to intern at the Center for Global Studies, alongside my fellow interns Nay and Stacy. I took this opportunity to better learn the inner workings of an academic organization. Seeing how they organize, conduct outreach and work to provide academic funding for faculty and students alike. I also love to work with kids, and we’ll have a chance to do that with World Stories Alive! a language initiative on our part to expose local kids to foreign cultures and languages. In my first month of working at the Center for Global Studies we learned the ropes, coordinating our schedules, setting up office hours and setting up general responsibilities for the coming semester. I was responsible for attending a lecture on state building, and the recent experience of a State department official in Iraq. I learned a lot about the state department in Iraq and our efforts to rebuild the country following the end of the war. I hope this experience pushes me to learn things I would not have otherwise learned, and gives me worthwhile skills that I will be continue to use in future careers. I also hope to have conversations with people I would have otherwise not had the opportunity to talk to. At the most fundamental level, I hope to be exposed to foreign cultures, and learn about them in a fashion I otherwise would not have. This entry was posted in Reflections on February 6, 2018 by zzf5057. I am grateful to have been given this opportunity. The first month at the Center for Global Studies (CGS) has been pleasant. When it comes to work, there are two things that are most important: the work itself and the colleagues. Fortunately, at the CGS, work is interesting and so are the people. A lot of planning went in for the upcoming events for the semester – a semester lasts four months- that are quickly approaching. The interns had a taste of the pace of the work and the communication that is essential for the success of the center’s work. 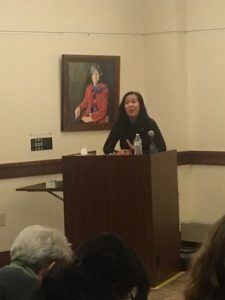 I had a chance to go to my first 2018 Spring Series event where I was introduced to an immigrant, writer, novelist Lisa Ko and her book The Leavers. The book explores the life of a Chinese illegal immigrant in the US and her separation with her son as she was captured by US Immigration and Customs Enforcement (ICE). He son was adopted by a wealthy Canadian couple and the book explores his search for his long-lost mother as well. Besides the cool event, I have been given a chance to help organize our very own World Stories Alive (WSA) where we invite speakers of foreign languages to teach languages to kids as young as two to primary school students through songs and stories. We cordially invite you to our event. So far, the work has not been hectic, but soon it should. I expect to be able to continue doing the things that I have been, but at a higher intensity in the coming months. I also expect to work on a curriculum development which I am excited about. I gave my shot at this internship because I was excited and interested and so far, the center hasn’t disappoint. It will be a good way for me to end my undergraduate career, working alongside my new friends at CGS. This entry was posted in Reflections on February 1, 2018 by Nay Min. My first month experience at The Center for Global Studies was already very impactful for me personally and professionally. The environment at the office is really collaborative and has a lot of open space to ask questions and to be hard-working, which I really appreciate and respect. Being a freshman, it is a really cool thing for me to experience being in a professional setting with individuals who are very different from me because I can learn from their experiences and their expertise. I had already attended a couple of events through CGS such as the SIA lecture given by James Piazzia on Terorism, an event with Lisa Ko, author of The Leavers, and an event co-sponsored with the CGS and the Career Enrichment Network on a workshop for Jobs and Internships in the Government during Liberal Arts Career Week. All of these events were very diverse and really informative for me on things that I can use academically, professionally, and personally. I really enjoyed the Terrorism lecture because it gave me some insight into the professor who I might end up taking a class with next year. I enjoyed the event with Lisa Ko because it was in a different setting to talk about global issues in terms of having those hard discussions on immigration through fiction and personal stories. The workshop on Jobs and Internships in the Government is one that I am going to write about in the newsletter because they gave out so much professional information on how to apply for a job/internship on a database as difficult as USAJOBS, or how the timelines of applications and when to be thinking about certain opportunities and how to prepare for them while making the most of your time at Penn State. All of these different events already have me thinking in various different directions on how we can have global conversations on campus through different mediums. As for my expectations for my time at the Center, I really don’t have many. I came to this experience with an open mind, so I don’t want expectations to affect my outlook or opinion on the work that I am going to be doing. Sarah really took to heart the goals that I shared with her during my interview and already gave me a small grant writing project that I am working on currently, which I really appreciate! I don’t want to have expectations because I want to develop myself through various different tasks that I hope to be doing, so I don’t want anything to deter me from that development. Overall, I am really happy with my time at CGS already, and I am really excited for all of the upcoming projects! This entry was posted in Reflections on February 1, 2018 by Stacy Brehman.